I have to start by saying that I’m not the biggest of girls and sadly not as curvy as I’d like to be but there was a stage before my wedding in 2010 when lets just say I was putting on weight very quickly due to being ‘in love’ which I still am just for the record. I was gloriously happy eating what I wanted and enjoying the courtship with my now husband, and then it took a few really bad photos of me to realise I needed to get into shape as I wasn’t feeling great within my body. I managed to shift my belly handles through using a well known food home delivery plan that I stuck too. One of my weaknesses was and still is Chocolate. Women crave it, men hoard it, and Aztec kings were said to have been the first to eat it. Eating chocolate results in feel good neurotransmitters (mainly dopamine) being released in particular brain regions. Most people love chocolate, not because of the greatness of the bean but the predisposition to love fat and sugar. My love affair with the chocolate bean is not going away anytime soon so when I was sent the following two premium products as part of the Benevita Weight Management System by the lovely team at BellaKidz I quite happily got to the main job of tasting. The Shake-It Chocolate drink which incidentally is also available in Vanilla is made using 300ml of cold water. This makes it a thick consistency and I have to say it did keep me full for a few hours which I drank at lunchtime. It tasted tasted really nice but I did have to mix it thoroughly. The good thing was I didn’t have to go and raid the basket of goodies for my afternoon snack. There is a proven appetite suppressant called glucomannan which might have something to do with that. 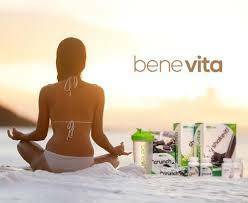 I do understand that meal replacement drinks are not always ideal but I think if I wanted to lose weight I would definitely continue with these which are also fine for vegetarians and contain no preservatives, artificial flavours, or artificial colours. This shake per serving is 200 calories. There is something about chocolate, there is something in chocolate, there is something we know about chocolate that is beyond touch, taste and tantalizing sensations. 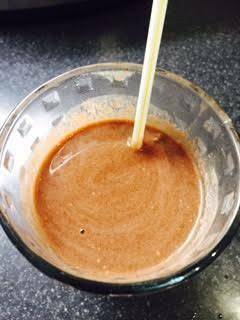 This silky chocolate flavoured elixir Shake-It! is specifically formulated to enjoy as a meal. It was created from our deep love of the whole food, the cacao bean. Cacao is truly the food of the gods and it contains a full spectrum of vitamins and minerals. Spoil yourself for breakfast, lunch or dinner with Shake-It! 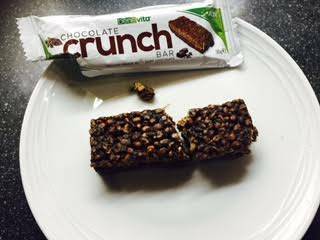 I was also sent the Chocolate Crunch Bar which I personally found to be a little too sweet for my taste buds even though it is labelled low in sugar. 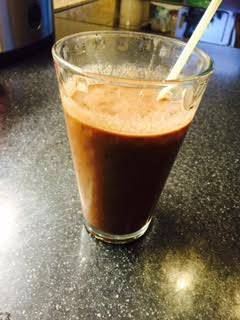 This is a dark chocolate treat and high in protein at 129 calories. The bars are ideal for when you’re on the go and in need of a boost before or after a workout. The texture was chewy but I much preferred the shake and would happily carry on with them. When it comes to buying these items they can only be ordered online. If you are on a weight management journey I wish you luck!